There’s no doubt about how powerful Facebook is for businesses. However, just because your business has a fan page doesn’t mean you’re achieving great results, if any. 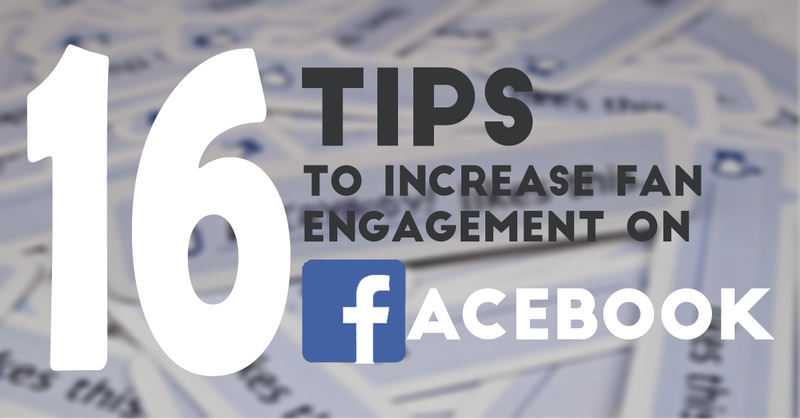 In this article, I’m going to share sixteen powerful tips to get the most engagement on your Facebook! 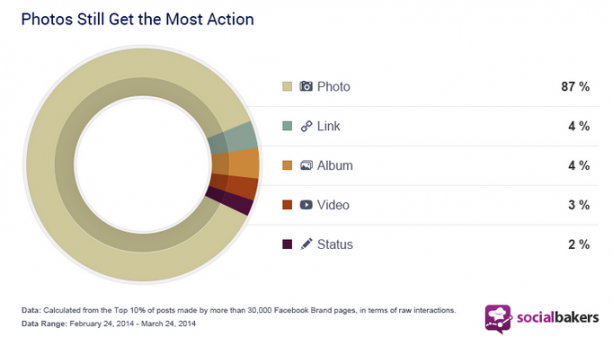 Did you know photo posts are the most shared on social media platforms? They have an average of 87% more interaction on Facebook! One of the best ways to optimize your images is to offer variety. Post photos including industry-related subjects, people, or quotes. This way you’re sure to appeal to everyone in your audience! 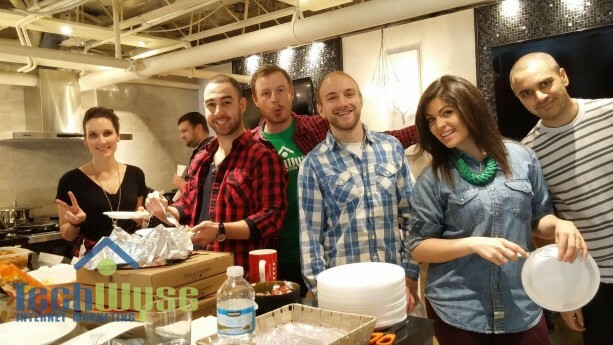 From experience, our company page generates the most engagement from event posts, team photos, and simply fun pictures in the office. This is because people like to see the faces of a company and build a connection with you. If you have a beautiful office, why not share it with your fans? It can get boring when they only see company and industry related news, so familiarize your fans with your company culture, too! Contests, promotions, and giveaways are great ways to boost your likes. Companies leverage the use of contests to increase engagement for their brand because it works! Consider having incentives for your audience to participate. It can be gift cards, coupons, or even a simple thank-you card. You can also send them company products as well, such as pens, notepads, or post-it notes. 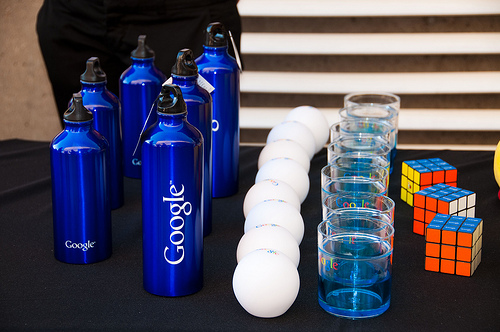 Google does really well in sending their customers amazing company goodies and swag! It’s not easy to start a contest though. Strong Facebook contests require planning, execution, and follow-ups. You want to create a contest that is too hard to say no to. Here is a great article on creating a perfect social media contest! Timing is extremely important. When you’re scheduling your Facebook posts, you want to optimize the day and time that will help you generate the most traffic and interaction. According to an infographic from QuickSprout, the best day to post on Facebook is Thursday and Friday. When would be the optimal time to post? Ideally, you want to post early afternoon on Facebook. Your audiences may have work during the day, so the best time for them to browse Facebook is during lunch time and their after-work commute. Therefore, try posting around 12:00pm to 1:00pm to have your post readily available for your fans when they go for lunch. As for your commuters, you can capture them on their way home between 4:00pm and 5:00pm. Another great time to consider is in the morning. You can schedule your Facebook post to be live between 6:00am to 8:00 am. This way, your post will already be available by the time people check their Facebook in the morning. Your fans come from different places in the world. However, tailor your posts to where a majority of your fans are and what your own time zone is. Test different times and see what works best for your audience! Here is a great article that will help you find the best time to post on Facebook based on your own Insights. 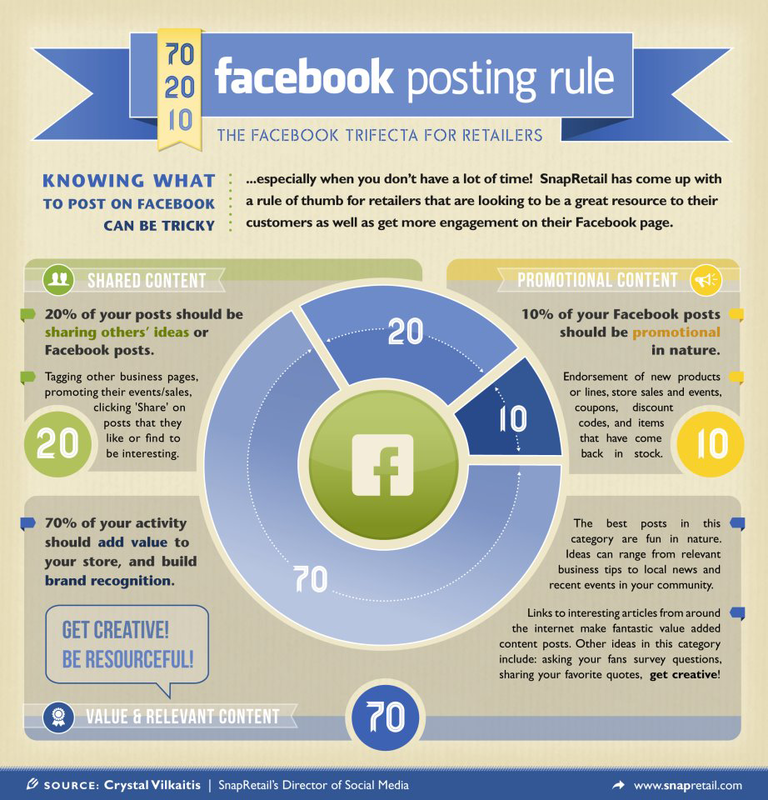 According to BufferApp, posts with 80-89 words are best for engagement. It’s true that readers like to keep things simple and be able to digest messages quickly. However, it is suggested that engagement is higher because readers click on the “Continue Reading” link. You want your title and introduction to catch the attention of your readers. You can apply this to your Facebook post. Make sure you capture your reader’s attention right at the start, so they’ll be interested in clicking through to the rest of the article. 6. Celebrate Holidays and Events! When there are awareness days, holidays, and special events, share it with your fans. You want to show personality and awareness of the things happening around you. This also makes you seem less robotic. Be cautious of which countries the holidays apply to. Is it a Canadian holiday? American? British? Or is it celebrated internationally? You want to connect to all your fans! 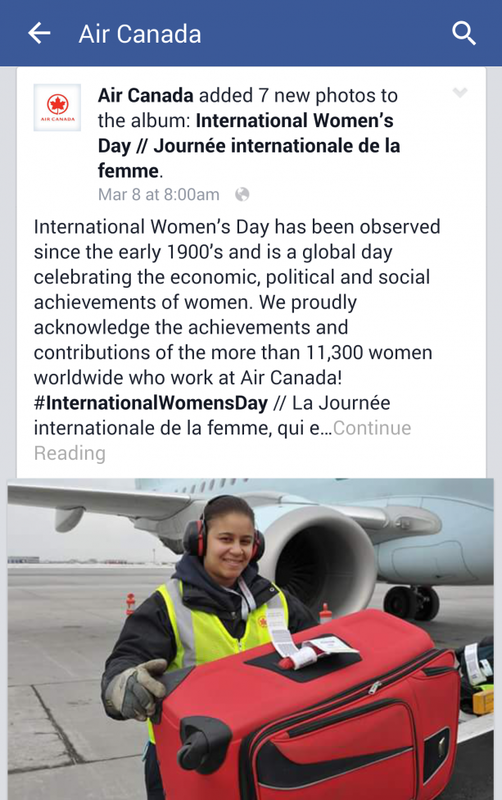 For example, on International Women’s Day, share a post or image that shows your appreciation. 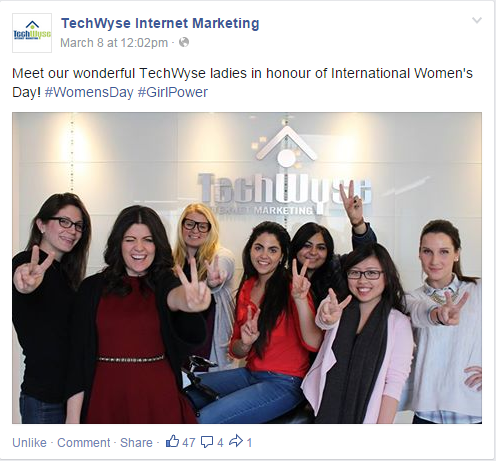 Our company shared a photo of some of our talented management team ladies! Hashtags can turn your word, phrase, or a specific topic into a clickable link. It allows people to find you through that targeted topics and hashtag. You can even use them to generate conversations. When someone searches for the topic you’ve hashtagged, #Marketing, for example, then your post and everyone else who has included #Marketing in their post will appear as a result. This can drive traffic to your post and website! Here are some tips on how you can use hashtags for your Facebook business page! I talked about categorizing your posts with hashtags, but another fun way to engage with the community is through hashtag events. There’s tonnes already in use, and not only do they apply for Facebook, but on other social media platforms, like Twitter and Instagram, too. You’ve probably encountered many of these before. You can upload photos for #TBT or #ThrowbackThursday. This is a great one because you can share photos from the past of your office, your employees, and anything related to your industry! Participate in what you’re comfortable with and is effective for your page. In the end, you want this to grow your audience and increase awareness. Whether you have one comment or 20 comments, try to reply to all them! Facebook gives you the option to like someone’s comment, which is a great and easy way for you to acknowledge them. Commenting can be time-consuming, but you want to build relationships with your fans. This way it shows that your company cares and they’ll want to come back to your site. Facebook has their own tool for you to analyze your performance, which is quick and easy to use. 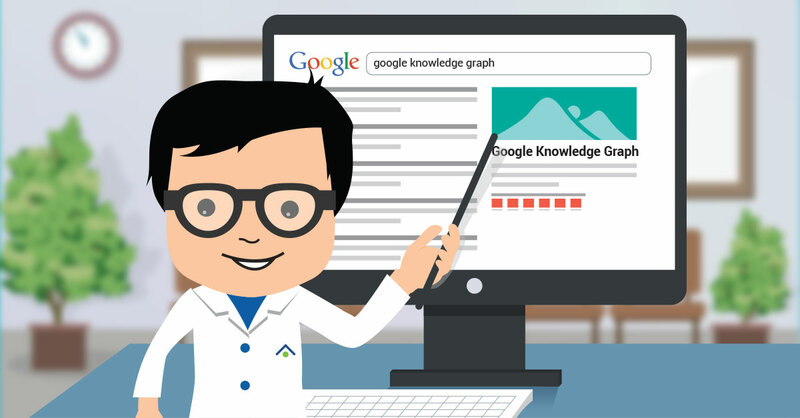 You have to check the performance of your page and see what’s working and what’s not! 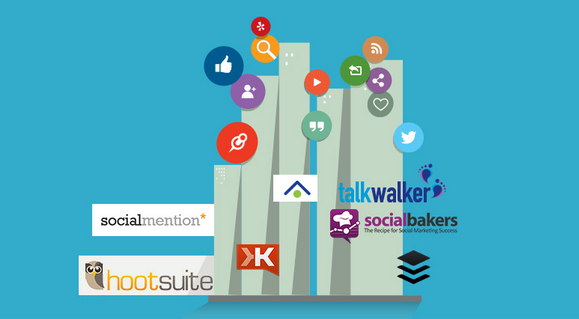 Here is a great list of social media tools you can use. Other than Facebook’s own insights, you can use tools such as Hootsuite, Google Alerts, and Social Mention to browse popular topics and manager your accounts. By knowing what is trending, you can stay on top of the game. Sometimes, you just need to have fun. Your company shouldn’t strictly be business related, because it makes you seem robotic and will encourage less people to connect with you. 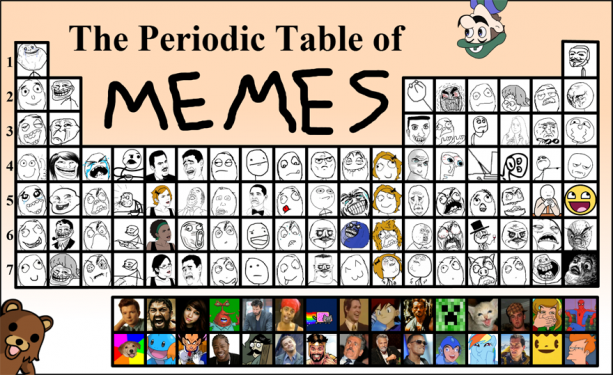 Share memes, funny photos, and jokes with your fans. Humour can receive high engagement. However, watch out for what you’re posting. Many companies have made mistakes of trying to be funny, but in the end, they were being offensive. Before you post a funny joke or photo, make sure its safe for your fans and can give a positive impression of your company! You can ask personal questions, too, which allows you to get to know your fans, such as, “What’s your favourite social media marketing tool?” or “What’s your favourite website design? Share us a link!” Show that you’re interested! It’s recommended that you follow the 70/20/10 Facebook posting rule. You want to promote your business and services only 10% of the time. The truth is that if everything is about you, your fans will get tired of it. 70% of your posts should show value like interesting articles, your blog posts (which you better have! ), and anything creative like pictures, questions, and local news. The final 20% should be reposts and other people’s content. This gives you a nice balance of everything! If you’re not using any social media management tools, Facebook conveniently has the option to schedule posts. This is great because it allows you to post at different time zones to suit the needs of your fans. In addition, you can schedule things to post over the weekend. Keep in mind though, social media never sleeps! You want to check your Facebook page once or twice during the weekend to see if there are any comments that you have to attend to quickly. Another fun way to engage your readers is to share some knowledge. Let them know about the recent stats and facts that they might not know about. It doesn’t have to be relevant to your industry, its just to generate some conversation on your Facebook. I shared a picture of our Director of Marketing recently with a big smile captioned: “Did you know smiles are contagious? 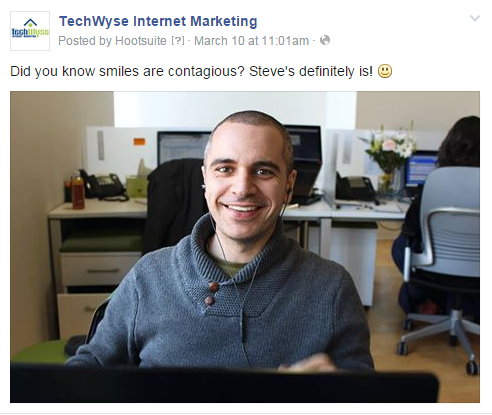 Steve’s sure is!” It wasn’t related to our industry, but it gives our Facebook a human touch. The last and final tip is to be genuine! I’ve had countless Twitter conversations with marketing professionals and we’ve all agreed how important it was to stay genuine. You want to show your fans that you care and are interested. Show them you want to help by engaging with them and treat them like a friend! Give them a positive and real experience and they’ll be sure to come back to your page. Those are my sixteen tips for you! What are some powerful tips that you use to increase fan engagement? Let me know in the comments! Wonderful post Cherry. Lots of great info, even for the seasoned social media marketer! Thanks Dejeesh! Of course, it’s much better to post when your audience is visiting Facebook. I would like to add one more insight ‘Time of posting’, this plays an important role in user engagement. Great post, Cherry. I also noticed that posting office and staff photos gives very nice results – even more, this method turned out to be the most effective for one of my pages. Thanks Tim! That’s awesome 🙂 For sure, I really love seeing staff photos from companies. They make me feel connected to them.